The International Day of Yoga/Yoga for Warriors conference 2018 was held at the Gonzalez Convention Center in San Antonio on June 9. One of the highlights of the conference is the talk titled “The Science of Yoga” by Dr. Sat Bir S. Khalsa, Assistant Professor of Medicine at Harvard Medical School. A search for “yoga” in Pubmed will result in thousands of research articles and one need a good amount of time to browse them. Dr. Khalsa very neatly highlighted the research on yoga from 1955-2018. What an amazing talk! Had I heard his talk earlier in my life, I would have been a long-term yoga practitioner by now. Before I go into the lecture, let us know few definitions. What is yoga? The basic elements of yoga practice include physical postures, breathing, deep relaxation and meditation. What is meditation? Meditation is focusing, losing and getting back the attention. What is mindfulness? Mindfulness is nothing but awareness of one's body and mind. Dr. Khalsa started with quotes of Sri Aurobindo and Yogi Bhajan. He also quoted Indian Prime Minister Modi's speech at United Nations General Assembly. “...a methodised effort towards self-perfection by the expression of the secret potentialities latent in the being...a union of the human individual with the universal and transcendent existence...” -Sri Aurobindo. “Yoga teaches you the techniques and awareness to stay healthy. You gain strong immune, glandular and nervous systems. This foundation gives you energy and lets you deal with the mental and spiritual facets of your life.” -Yogi Bhajan. “Yoga is an invaluable gift of our ancient tradition. Yoga embodies unity of mind and body; thought and action; restraint and fulfillment; harmony between man and nature; a holistic approach to health and well being. It is not about exercise but to discover the sense of oneness with yourself, the world and the nature. By changing our lifestyle and creating consciousness, it can help us deal with climate change. Let us work towards adopting an International Yoga Day”. -PM Modi at United Nations General Assembly, 2014. Do you know that yoga practitioners in the United States have increased from 15.8 million in 2008 to 36.7 million in 2016? Before going into the talk, Dr. Khalsa said the research on yoga is not about discovering but about re-discovering the Science of yoga. He brought the scientific studies on yoga to light. Those include Neurological, Musculoskeletal and Molecular Biological studies. They were done at reputed institutes such as National Institute of Health, Harvard Medical School, Massachusetts General Hospital or University of California, Los Angeles. Here is the summary of what I grasped from his lecture. For more details, please refer the research articles mentioned under "references". Yoga has been shown to therapeutic for diabetes, cancer, mental health, lifestyle diseases (cardiovascular system disorders, insomnia), metabolic syndrome, endocrinology disorders. Search in Pubmed. Yoga for prevention of lifestyle diseases. Search in Pubmed. A person like me (with a scientific research background) or a middle school teacher, no matter what the background enjoyed his talk. Thanks to Dr. Nayak for inviting him to the IDY conference and thanks to Dr. Khalsa for accepting the request to give a talk to general audience. (1) Wenger MA, Bagchi BK, Electro-physiological correlates of some Yogi exercises. Electroencephalography and Clinical Neurophysiology, 7 (Suppl):132-149, 1957. (2) Green E, Gren A. Beyond Biofeedback, Knoll Publishing Co. inc., 1977. (3) Lundberg U. et.al. Stress management: A randomized study of cognitive behavioural therapy and yoga. Cognitive Behaviour Therapy, 35(1):3–10, 2006. (4) Bernasconi C et. al. Reduced hypoxic ventilatory response with preserved blood oxygenation in yoga trainees and Himalayan Buddhist monks at altitude: evidence of a different adaptive strategy? Eur J Appl Physiol. 2007 Mar;99(5):511-8. (5) Jensen JE et.al. Effects of yoga versus walking on mood, anxiety, and brain GABA levels: a randomized controlled MRS study. J Altern Complement Med. 2010 Nov;16(11):1145-52. (6) Alavi A et.al. Cerebral blood flow differences between long-term meditators and non-meditators. Conscious Cogn. 2010 Dec;19(4):899-905. (7) Barsalou LW et.al. Mind wandering and attention during focused meditation: a fine-grained temporal analysis of fluctuating cognitive states. Neuroimage. 2012 Jan 2;59(1):750-60. (8) Bushnell MC et.al. Insular cortex mediates increased pain tolerance in yoga practitioners. Cereb Cortex. 2014 Oct;24(10):2732-40. (9) Khalsa SBS et.al. Effects of a Kundalini Yoga program on elementary ans middle school students' stress, affect and Resilience. Journal of Developmental and Behavioral Pediatrics, 39:210-216, 2018. (10) Lavretsky H et. al. Yogic meditation reverses NF-κB and IRF-related transcriptome dynamics in leukocytes of family dementia caregivers in a randomized controlled trial. Psychoneuroendocrinology. 2013 Mar;38(3):348-55 (11) Unterrainer HF et.al. The relationship between yoga involvement, mindfulness and psychological well-being. Complement Ther Med. 2016 Jun;26:123-7. I am posting this to raise awareness about Congenital Heart Defect (CHD). CHD awareness may save a life, it could be you or it could be someone that you know. In the recent years, you might have heard heart related death in middle aged Indian men and women more often. You likely heard the terms “Heart attack” or “Cardiac arrest” more than “Heart failure”. Heart failure happens when the heart cannot keep up with its workload. Lets see in detail. "Congenital" means "present from birth". CHD is one or more abnormalities in the heart's structure that one is born with. It may produce symptoms at birth, during childhood and sometimes not until adulthood. In USA, 1 in 150 adults are expected to have some form of CHD. I believe the statistics is similar in India as well. There are several (20+) types of defects. Lets learn more about the most frequently diagnosed CHD in adults known as Atrial Septal Defect (ASD). ASDs are twice as common in women as men! Image Courtesy of the Centers for Disease Control and Prevention, National Center on Birth Defects and Developmental Disabilities. As you may know, the heart contains 4 chambers. 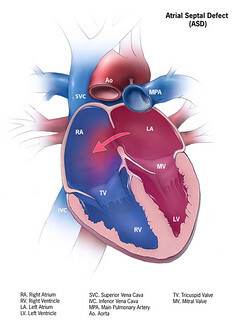 2 upper chambers: the right atrium RA, left atrium LA and 2 lower chambers: right ventricle RV, left ventricle LV. The RA receives the deoxygenated blood which it then pumps down to the RV which in turn sends to the lungs. The LA receives the oxygenated blood which it pumps down to the LV which in turn sends to all body parts. During the baby development inside the womb, the septum (wall) separating the two upper chambers of the heart will have several openings. They usually close during pregnancy or shortly after birth. If the opening does not close, a hole is left and it is called as an ASD. 1) Pulmonary arterial hypertension leading to arrhythmias. Most causes of CHDs are unknown, however multifactorial inheritence (environmental and genetic risk factors) may play a role. 8) decreased exercise tolerance or tiring easily. 1) Cardiac Catheterization – a non-invasive procedure in which the ASD/hole is sealed by implanting a closure device. 2) Open Heart surgery – in which small holes are fixed by sutures, larger defects are fixed with a special patch that covers the hole.